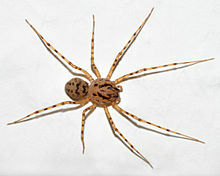 Scytodes is a genus of spitting spider that occurs all around the world. The most widely distributed species is Scytodes thoracica, which originally had a palearctic distribution, but has been introduced to North America, Argentina, India, Australia and New Zealand. See List of Scytodidae species#Scytodes. Females carry their eggs until they hatch. Upon hatching, the juvenile spiders remain in their mother's web. They cooperatively capture and feed on prey caught in the web. Upon reaching sexual maturity, the young spiders leave the web, move a short distance away and exhibit solitary behavior. The spitting from which its name derives is used as a method of trapping prey or escaping predators. Sticky gum is expelled from their fangs and can be shot up to ten body lengths from the spider. ^ a b "Scytodes". World Spider Catalog. Retrieved 22 August 2017. ^ Li, Daiqin; Jackson, Robert R.; Barrion, Alberto T. (March 1999). "Parental and predatory behaviour of Scytodes sp., an araneophagic spitting spider (Araneae: Scytodidae) from the Philippines". Journal of Zoology. 247 (3): 293–310. doi:10.1111/j.1469-7998.1999.tb00993.x. ^ a b McAlister, W. (1960). "The spitting habit in the spider Scytodes intricate Banks (Family Scytodidae)". Texas Journal of Science. 12: 17–20. ^ Gilbert, C.; Rayor, L.S. (1985). "Predatory behavior of spitting spiders (Araneae: Scytodidae) and the evolution of prey wrapping" (PDF). Journal of Arachnology. 13: 231–241. Retrieved 24 May 2018. Wikimedia Commons has media related to Scytodes.